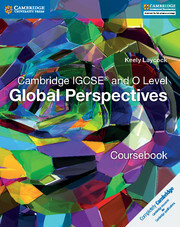 Feel confident exploring key global issues from multiple perspectives with Cambridge IGCSE® and O Level Global Perspectives, a brand new coursebook from Cambridge University Press to support study of the Cambridge IGCSE® and O Level Global Perspectives syllabuses, for first examination in 2018. 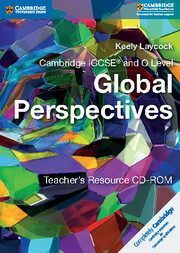 Taking a completely skills-based approach, and written by a Global Perspectives specialist, the coursebook is structured around the key skills students must demonstrate, with references to relevant syllabus set topics. Each chapter contains multiple activities to encourage active engagement, assessment practice opportunities and differentiation support so that teachers can focus on the particular needs of their class. Activities throughout the chapters so that students can work independently, in pairs or in small groups, to encourage an exploratory and active approach to learning. Selected global topics from the syllabus are integrated throughout chapters to illustrate how the syllabus skills can be developed through them. Differentiated practice opportunities at the end of every chapter, divided into sections focused on developing, establishing and enhancing students' skills, to support students at every level. Guidance on the written examination, the individual report and the team project, to prepare students for their assessment. Definitions of key terms displayed alongside relevant text to aid accessibility and support EAL learners.